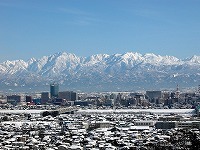 Toyama Prefecture is situated in the center of Honshu, the main island of Japan. In April 2005,Toyama City, the capital of the prefecture, merged with six neighboring towns and villages and became a huge city with an area of 1241.85 square kilometers, from sea-level to 3,000 meters above sea-level, and with a population of 420,000. However, Mr. Masashi Mori, the first Mayor of the New Toyama City, has proposed a plan to create a “Compact City” and reduce the city’s administrative costs. "The old city was continuing to spread in terms of size and functions, and consequently it stagnated. So the new city should shift to a policy of creating a core area with intensive functions, that will enable people, goods, and money to move easily. In order to do so, it is essential for the city to build up public transportation systems like railway and bus services”, Mayor Mori gives his vision of the city’s future. In order to stop the hollowing out of the city center, he currently puts up three major pillars to deliver: live in the city center; create a core area for people and business to interact; make public transportation systems more user-friendly. Meanwhile, Toyama city puts up a slogan: Citizen-friendly and Environment-friendly City Toyama, and tries hard to make it happen by implementing measures to transform the social structure of “mass-production, mass-consumption, and mass disposal” into that of “resource-saving, energy-saving, and recycling”, - in other words, a recycling-based society. Toyama City Eco Townis the leading project in this field and 8 recycling plants are currently in operation. It aims at zero emission, and the ultimate goal is to use up all production components in new products. In February 2007, Toyama City and Aomori City were authorized as the first local municipalitiesamong others to promote the city center for re-energizing the local economy. What can they deliver to reduce administrative costs which had swollen as the size and functions of the city continued to spread in the past? How can they tackle the globally imminent environmental issues? The tour will visit Toyama City, quick to respond to problems common to all local governments, and see what is actually happening today, then try to predict the Japanese way of life tomorrow. *Toyama CityToyama City, Toyama TV(the hosts) and Foreign Press Center, Japan have co-organized this press tour. ●Bring people and business to the city center, a core area of "Compact City"
Born in Toyama in 1952, Mr. Mori was first elected as an Assembly Member for Toyama Prefecture in 1995, re-elected in 1999, then elected as Mayor of Toyama in 2002. In April 2005, New Toyama City was born of a large merger of six neighboring municipalities. Then Mr. Mori was elected as the first Mayor of the new city. Since he took office, he has been working hard on such issues as the municipal merger, public transportation, elderly care, and bringing more foreign visitors to the city. He has also acquired a good command of the Korean language. The motivation came to him at a historic moment, the collapse of the Berlin Wall that happened when he was working as a judicial scrivener. As a Japanese citizen, he wanted to be able to help people in the neighboring countries if some drastic change were to occur in Korean Peninsula. He started learning Korean on his own and mastered it. In addition, he is currently learning Italian. His talents include playing the saxophone. On September 17, the Grand Plaza, the city’s first shopping mall, opened as the city’s core area for inviting people and business. The band of the mayor and his colleagues, named “Shiyakusho (city hall) Band”, played jazz to celebrate the launch. In the tour, Mayor Mori will be keen to speak on “Compact City Toyama’s today and tomorrow”. As a leading project for re-energizing the city’s economy, Toyama Light Rail, a tram system built by the local government and run by the private sector, started operation in April 2006. This was the first attempt in Japan to revitalize the JR Toyama-ko Line, which was in the red, as a next generation tram system. Mayor Mori himself is in charge of its operation as the Chairman of the third sector company, Toyama Light Rail. Nicknamed “Portram”, the tram cars are easy-access, designed for the elderly and the handicapped. The rail tracks are stable and quiet as they are laid with a resin, a popular method in Europe. The rails were also imported from Luxembourg. Toyama Light Rail was expected to be in the red in its first year. In fact, it attracted about 5,000 passengers or more a day and became popular as the “citizens’ feet”. The Company currently plans to work with the city’s old tram systems and also make the Light Rail a circle line. It also suggests an environmentally-friendly “park and ride”, enabling car commuters to come to a station nearby and take the train, leaving their cars in a parking lot at the station. Toyama Light Rail has become the face of Toyama, the city of environment. This is the 16th Eco-Town plan in Japan and the first in the Hokuriku area, approved in 2002 by the Ministry of Economy, Trade, and Industry and the Ministry of the Environment. They gave top marks to the original and advanced nature of the plan, which aims to develop key resource-cycling facilities to stimulate the regional circulation of recycled products, featuring plastic processing and other local materials industries in Toyama City, as well as agriculture and housing manufacturers. The tour will visit two of its facilities, Toyama BDF Co., Ltd. and Toyama Green Food recycle Co., Ltd., that produce the new energy “bio fuel”, and make efforts in reducing green house gas and improving Japan’s energy self-sufficiency. 3. Toyama BDF (Bio Diesel Fuel) Co., Ltd. These days, the world expects BDF, bio diesel fuel, to be a solution to the increasing threat of global warming.Toyama BDF collects waste oil from households, restaurants, and school lunch centers, and operates the BDF refining plant, the largest in the country. The produced BDF is currently used by the city’s garbage collection trucks and buses. Still, there are such points to be improved as the method of collecting waste oil, economic feasibility of production, and problems with car engines. In Europe and the United States, they started using BDF in the ‘90s, and now the expectation for it to be a practical source of clean energy is higher all around the world. The tour will learn the current situation of the made-in-Toyama BDF. 4. Toyama Green Food Recycle Co., Ltd.
“Local production for local consumption” can help to reduce CO2 emissions by reducing the transportation inputs in production. This company, together with people in Toyama, is trying an extension of that concept: “local disposal for local recycling”. The company collects food waste and tree pruning and other plant debris, then chops it into piece for methane fermentation. Its facility generates bio gas which reaches 2,500 cubic meters of biogas a day. Three-fifths of the output, 1,500 cubic meters a day, is used to generate up to 1,800 kilowatts of electricity a day, enough for 5 months’ consumption by a household of 4 to 5 family members. The remaining 1,000 cubic meters day of bio gas is to be sold, and the fermented food and plant waste, composted during biogas production, becomes fertilizer for sale. 5. Minamoto Corporation - Sending sushi into the space! Mr. Kinichiro Minamoto founded the company in 1908 and created its main product named “Masu no sushi”, or trout sushi, from his wish to make tourists feel at home when they eat ekiben, train box lunch, by giving them something they eat at home. At the time, as variations of the train box lunch menu were limited to Makunouchi bento, a lunch box with rice, fish, and vegetables, or sandwiches. He wanted to produce ekiben, train box lunch, with local traditional food and developed “Masu no sushi” which could keep for two days at room temperature. Next year Minamoto will mark 100 years from its foundation and plans to celebrate it with its new project - sending sushi into the space. Mr. Hachiro Minamoto, the 5th generation president, wishes to make astronauts feel at home by giving them masu no sushi to eat in space, and is currently doing R&D of sushi-type space food with Toyama Prefectural University. 6. Seisan Gijutsu Co., Ltd. Founded in 1973 by Mr. Takao Horibe, the current president, the company produces, sells, and rents industrial robots and machines nationwide. From a start in renting robots in 1992, it has extended its operations into R&D and production. At present, it not only rents robots and welding/cutting machines to its clients, manufacturers in almost every prefecture, on a 24/7 basis, but also designs production systems to fit each client’s operations and trains clients’ workers. It has 10,000 robots/machines are ready to be rented any time, in preparation for emergency situations such as a stalled production line caused by a robot’s breakdown or a natural disaster or to respond to a temporary increase in production. The company welcomes visitors and gives them an easily understood introduction to the cutting edge technology, displaying mainly robots currently used in the entertainment business in an exhibition space in the No. 8 plant. 7. Mitsuoka Motor Co., Ltd. Founded in 1968, it obtained authorization from the Ministry of Transport for their zero-one style car in 1996 and was approved as the 10th motorcar manufacturer in Japan after Honda Motor Co., Ltd. Chairman Susumu Mitsuoka, the founder, takes as his motto the creation of cars that express their owners’ personality and life style, something that mass-produced cars cannot do. The best example of it is the latest everyday Super Car “OROCHI”- meaning a huge serpent from the Japanese myth-, which disproves a conventional wisdom of super car. “If you really want to stand out from the crowd, nothing comes close to the Orochi”, the Britain’s Auto Express magazine praised highly. On the tour, Chairman Mitsuoka, together with Mr. Aoki, creator of OROCHI, will tell us about his dream and vision in his original way of car making as well as the history of his fight for deregulation. -Travel by Light Rail from Toyama-kita-eki　Sta. to Jogawara Sta. -Visit facilities: Toyama Green Food Recycle Co., Ltd. andToyama BDF Co., Ltd.
14:30-15:30　Visit Seisan-Gijutsu Co., Ltd.
16:00-17:00　Visit Mitsuoka Motor Co., Ltd.
4. Participants: Limited to the first 8 applicants on a first-come first-served basis. (2) Toyama City, Toyama TV and FPC will not be liable for any inconvenience, trouble or accident that might occur in the course of the tour.